I thought before I write up any of my toddler themes, that I would first give a run-down on how my new storytimes are planned and prepared! I have been using Lindsey’s AMAZING toddler planning sheet for toddler storytimes. I tweaked it just a little bit by changing “Stamp Used” to “Supplies Needed” since we don’t use stamps at my library. That way I have a supply list of things to make sure I have everything. Hi everyone! My name is Miss Katie and I’ll be leading the toddler storytime class this session. I’d like to go over some guidelines with you before we begin. Because I’m used to working with small people, I understand that accidents happen — I have tissue, wipes, and paper towels on both sides of the room in case of accidents. Bathrooms are located on either side of the storytime room, please feel free to use the bathrooms and supplies as needed. Lastly, you are your child’s best model for storytime. If you participate, they will participate. So, I want to see lots of movement and hear lots of voices! Let’s get started! I learned this from my wonderful co-worker who does it at her baby storytimes. Since babies “graduate” into the toddler storytime, I really wanted to keep the consistency of a few things between the program. This gives each child a chance to say their name (some will, some won’t) and if not, the parent can introduce. It’s a great way for the whole group to learn names together and it doesn’t take too long with my classes capped at twenty toddler/parent pairs. Although I sing it a capella, I used “Clap Everybody and Sing Hello!” by Kathy Reid-Naiman, from her album “Sally Go Round the Sun.” I got the suggestion from Kendra who uses it for her toddler times and I learned it from King County Library System. Like Lindsey, I plan a lot more than I actually use. I plan 3-4 books, 1-2 puppet activities, 1-2 flannelboard activities, 6 songs/fingerplays, and 6 movement activities. There is absolutely no way that I would USE all of these activities, books, and songs in a single program, but I wanted to have them. I used Melissa‘s “This Is Big, Big, Big” as the beginning of my closing routine. I also used it while I was covering baby storytime in the spring and summer, so it was another nod of continuity. I’m still using a Song Cube, but I have changed up the songs that are on it. At the old library, I had “Apples and Bananas”, “Five Green and Speckled Frogs”, “The Ants Go Marching”, “Twinkle, Twinkle Little Star”, “The Wheels on the Bus”, and “Itsy Bitsy Spider”. But I got rid of “Apples and Bananas” since I started to dread singing it and “The Ants Go Marching” since it was too long of a song for the cube. I added “I’m a Little Teapot” and “ABCs”. Overall, I’m so much happier with this incarnation of the cube. I also took the time to memorize literacy tips to go with each of the songs on the cube so matter what song we roll, parents get a hopefully new tip! After seeing a version on Pinterest, I was absolutely IN LOVE with “Tickle the Clouds.” I knew that it had to be my new closing activity. Bubbles are a strong tradition at my library. The librarian before me did bubbles in toddler storytime, and we also do bubbles in baby storytime. And I certainly wasn’t going to break with tradition! Bubbles have become one of my favorite parts. Kids are SO EXCITED and parents surround them with phones to capture those moments. It’s adorable. And that’s the bones of every toddler program. In my write-ups, I’ll talk about what I actually used and what worked/didn’t. I’ll also likely talk about why I didn’t use some materials. As always, if I did a theme multiple times, I’ll write about all the sessions in the same post. 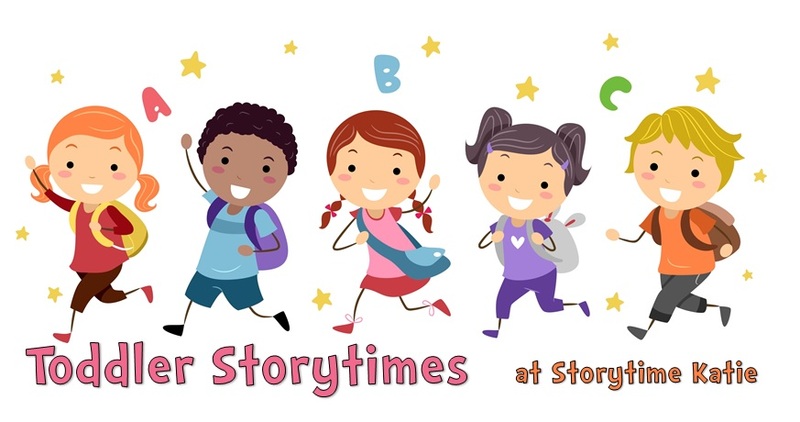 Look for a weekly toddler storytime update starting next week! How do you use bubbles? Do you just blow them around at the end? I’ve never heard of this, but it sounds fantastic! We use Gymboree bubbles which I cannot recommend enough. We have a red wand/blue pan set that they don’t make anymore. I blow bubbles into the air over the storytime rug while the toddlers dance and jump in the middle, waiting for them to come down. I make it a point to walk around the room and blow a set for each individual child. This is particularly helpful when the child doesn’t want to leave the safety of caregiver’s lap to go into the middle. Once every child gets his/her bubbles, this is the end of storytime for us. I blow a few more rounds of bubbles into the air before I head to the door. Some kids will not leave the room until every bubble is popped. Thanks for this outline Katie! I’ve been running a toddler storytime for a couple of years and I’ve always felt like I need a little more flexibility. I pick 3 books, 2 songs/activities/flannel boards and then bubbles at the end. I rarely, if ever, vary from that formula (passed on to me by the last person who ran the storytime). I really like the idea of having multiple books songs/activities to choose from depending on how the crowd is doing that day. And my kids LOVE bubbles!! I have an ipod and I throw on a song (usually Laurie Berkner) and everyone dances and sings while I blow bubbles. The end of the song is a nice natural ending to blowing bubbles. I feel like flexibility is the key for this age group! Toddlers are so unpredictable in their routines that I love having the extra options there to go to if they can’t handle another book that day. And mine love Laurie Berkner too! I love that planning sheet as well! I’m usually pretty comfortable being loose and flexible myself at this point, but we hire a team of students in the summer to run our programs, and this will help them immensely! I made something similar for them last summer, but its layout was a bit too rigid-I based it off of a lesson planning format I used when I was teaching. …I am so excited for bubbles! It’s a great planning sheet! Good; they are so much fun!